• Tenants — With Multi-Tenant licensed Smoothwalls, you must specify which tenant this directory service belongs. Appropriate network and filtering permissions can then be applied to those users from that tenant. Tenant administrators, that is, users who administer tenant operations via the user portal, use their Active Directory username to log into the user portal. It is important that username is part of the directory service specified here. To make full use of filtering policies, and apply permissions and restrictions to users, you should map your domain directory structure to Smoothwall local groups. 1. Ensure you have created local Smoothwall authentication groups — see Managing Groups of Users . 2. From the Directories table, locate and expand the relevant Active Directory directory (click the blue down arrow beside the directory name). 3. From the Group mappings table, click Add new group mapping. • Directory group — Select the Active Directory group to map from. • Local group — From the drop-down list, select the local group previously configured in step1. Note that more than one Directory group can belong to more than one Local group. • Enabled — New group mappings are enabled by default. Clear the check box to create a disabled mapping. Tip: The group mapping you create here does not necessarily have to reflect your Active Directory domain structure. You can choose to create group mappings according to the filter policies or permissions in your network organization. For example, as a school your organizational units may reflect the year or grade structure (Year or Grade 1), while group mappings reflect the school type (Junior School, High School). Tenant administrators, that is, users who administer tenant operations via the user portal, use their LDAP username to log into the user portal. It is important that username is part of the directory service specified here. • Cache timeout — Accept the default or specify the length of time the Smoothwall keeps a record of directory-authenticated users in its cache. 2. From the Directories table, locate and expand the relevant LDAP directory (click the blue down arrow beside the directory name). • Directory group — Add or select the LDAP group to map from. Tip: The group mapping you create here does not necessarily have to reflect your LDAP domain structure. You can choose to create group mappings according to the filter policies or permissions in your network organization. For example, as a school your organizational units may reflect the year or grade structure (Year or Grade 1), while group mappings reflect the school type (Junior School, High School). Tenant administrators, that is, users who administer tenant operations via the user portal, use their RADIUS username to log into the user portal. It is important that username is part of the directory service specified here. Note: You must use the same RADIUS group names as configured for the group_attribute parameter in your RADIUS server. For more information, refer to your RADIUS server documentation. 2. From the Directories table, locate and expand the relevant RADIUS directory (click the blue down arrow beside the directory name). • Directory group — Add or select the RADIUS group to map from. Tip: The group mapping you create here does not necessarily have to reflect your RADIUS domain structure. You can choose to create group mappings according to the filter policies or permissions in your network organization. For example, as a school your organizational units may reflect the year or grade structure (Year or Grade 1), while group mappings reflect the school type (Junior School, High School).  Tenants — With Multi-Tenant licensed Smoothwalls, you must specify which tenant this directory service belongs. Appropriate network and filtering permissions can then be applied to those users from that tenant. Tenant administrators, that is, users who administer tenant operations via the user portal, use their local username to log into the user portal. It is important that username is part of the directory service specified here. 3. Click Add. 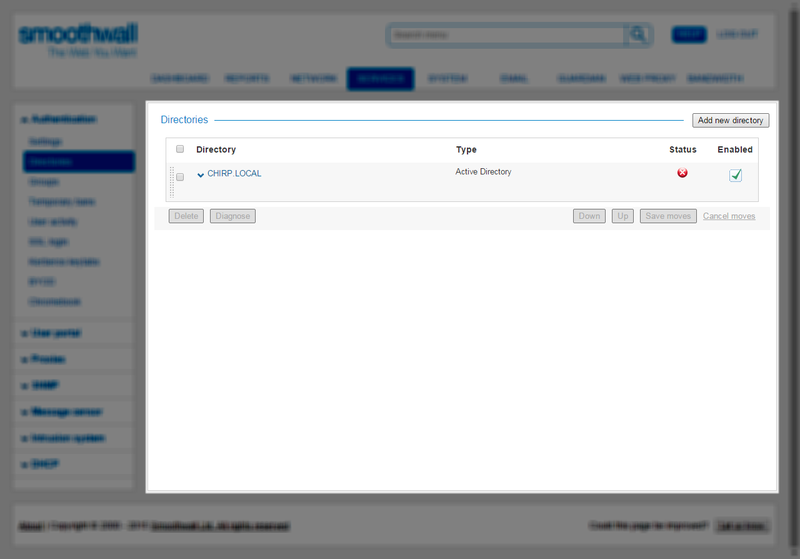 The Smoothwall adds the directory to its list of directories. For information about adding and managing local users, see Configuring a Local Users Directory. Note: Tenant administrators, that is, users who administer tenant operations via the user portal, use their local username to log into the user portal. It is important that username is configured here. 3. In the Edit user dialog box, make the changes required. For a detailed description of available settings, see Configuring a Local Users Directory.  It should be noted that this authentication service is for Google Apps domains. Networks using Google Apps Directory Sync (GADS) should configure the Smoothwall to use the Active Directory connection detailed above.  Multi-Tenant configurations for the Google directory service are currently not supported.  You cannot use Google as a directory as a standalone directory connection. It must be used in conjunction with Connect for Chromebooks where the Google Apps domain credentials are trusted — see Using Connect for Chromebooks.  Complete the configuration detailed below for setting up Google as a directory. • Enabled — New directories are enabled by default. Clear the check box to create a disabled directory service. • Name — Either accept the default name, or configure a new name for this directory. • Client secrets file — The Service Account JSON file downloaded previously (see Prerequisites). Click Choose File, and browse to and select the Service Account Key. • Administrative user — Enter the username, as a valid email address, of a user who has permission to access users, groups, and organizational units. The Smoothwall acts as this user to perform the username synchronization. Note: If you are configuring multiple Google Apps domains in your Smoothwall, it is recommended you avoid having the same administrative user for all. Attempting to synchronize these domains at the same time (see About Directory Services ) increases the chance of exceeding your Google API quota and rate limits (refer to the Google Developer console), forcing the synchronization processes to significantly slow down. • Comment — Enter an optional description of the directory service. Tip: Google makes use of both user groups and organizational units (referred to in Google documentation as both "organization units", "organizational units", and "OUs"). Google groups are to manage user contact, for example, email groups, whereas Google organization(al) units control service availability for users. The Smoothwall must hold an up-to-date copy of the Google Apps domain usernames, group membership, and organizational units structure to ensure Connect for Chromebooks authentication works seamlessly. In order to do this, you must synchronize your Google Apps domain with Smoothwall before continuing with the Connect for Chromebooks configuration; this is not an automatic step and must be started manually. It may take some time to synchronize the domain information. Refresh your browser to see the status of the synchronization. Any future updates made in that domain should be re-synchronized with the Smoothwall. To make full use of filtering policies, and apply permissions and restrictions to users, you should map your Google Apps directory structure to Smoothwall local groups. 1. Ensure you have synchronized your Google directory with the Smoothwall — see About Directory Services . 2. Ensure you have created local Smoothwall authentication groups — see Managing Groups of Users . 3. From the Directories table, locate and expand the relevant Google directory (click the blue down arrow beside the directory name). 4. From the Group mappings table, click Add new group mapping. • Directory group — By default, both Google user groups and organization(al) units are displayed in this box. Clear the relevant selection to display just Google user groups (clear Show OUs) or Google organization(al) units (clear Show groups). Select the relevant directory group to map. • Local group — From the drop-down list, select the local group previously configured in step 2. Tip: The group mapping you create here does not necessarily have to reflect your Google Apps directory structure. You can choose to create group mappings according to the filter policies or permissions in your network organization. For example, as a school your Google user groups and organization(al) units may reflect the year or grade structure (Year or Grade 1), while group mappings reflect the school type (Junior School, High School). Continue with the Google as a directory knowledge base article. 2. Expand the relevant directory group, and select the relevant group mapping. 4. Change the Directory group and the Local group as required.